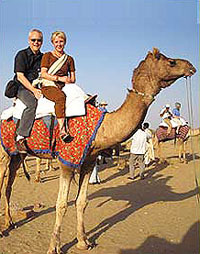 Rao Bikaji Camel Safari is a thrilling experience in Infinite Ocean of sand in Rajasthan. It is quite a new adventure in the smooth path of the desert. The beauty of the desert keeps on changing in every season. It looks all the more beautiful especially after rains. The beauty of the desert can be enjoyed by riding over camels or camel carts. Wide spread tranquility welcomes tourist at every step. Bikaner is well known for its intricate architecture, huge palaces and forts, traditional dishes, garments, melody of folklore and artistic footwear. Rao Bikaji Camel Safari offers you all. We are always ready to welcome your journey through deserts. The Safari Company called "Rao Bikaji Camel Safari" was started by Yogendra Singh Rathore in the year 2003. It is commonly believed that the river Saraswati is buried under the Thar Desert. Water is found very deep here. Wells are to be dug deep. Same is the case with the inhabitants of Bikaner. Their hearts are as deep as deep wells with water. Sands may be dry particles but not the hearts of the people. Sand dunes are beautiful to look at. They continue to be formed, shifts from one place to another and even destroyed. New dunes are formed everyday. A new dune is formed in the Thar city of Bikaner and that is Yogendra Singh Rathore, fondly called Rao Bikaji Camel Safari by his customers and friends. For all these years, Thar has seen many dunes taking shapes, many of them never to be formed again. Rao Bikaji Camel Safari has earned a world wide reputation today. It is recommended by almost all the well known tourist guides. Rao Bikaji Camel Safari is giving its services since 2003. The tourist group is led by Yogendra Singh Rathore himself. Rao Bikaji Camel Safari ( Yogendra Singh Rathore) also offers accommodation in his own guest house, quite home like where you can have a great time experiencing the true Indian life style. Desert Safari is a thrilling experience in infinite ocean of sand in rajasthan, india. It is quite a new adenture in the smooth path of the desert. The beauty of the desert keeps on changing in every season. It looks all the more beautifull after rain especially.The beauy of thar desert can be enjoyed by riding over ships of desert the camels,Wide spread tranquiliy,welcomes tourist . Bikaner is well known for its intrícate architectures huge forts, palaces,traditional dishes, garments,melody of floklore & artistic foot wear known as juti leather shoes,Rao Bikaji Camel safari offers you all. We always ready to welcome you & friends in your journy through desert. It is comonly believed that the river Saraswati is buried under Thar desert.Water is foundvery deep here almost 350 to 710 feet deep. Same is the case of inhabitants of Bikaner,There hearts are as deep as wáter. Sands may be dry particles but formed, shiftes fromed.Shifts from one place to another& even destroyed& new dunes formed every day. A new Camel safari has started as Rao Bika ji Camel safari which use to be part of camel man for many years .Now started own camel safari owend by Yogendra singh rathore well known as Yogi by friends & custumers. Is giving services since 2011Yogi also offers accommodation in his own house known as shri ram heritage/shri ram guest house, quite homly atmosphere where you can have a great time experiencing in his own house as family member even more he offer hotel bookings & reasport to other part of rajasthan & india.